A trip to Paignton Zoo! Every child (and most adults!) love a trip to the zoo, so when we booked our holiday this summer in Devon we knew Paignton zoo was going to be at the top of our list for places to visit. Paignton zoo has over 2000 creatures and 6 animal habitats so more than enough to keep the whole family happy and amused for the entire day making it a great full day out. Habitats including the Savannah and the Primley give a real sense for the habitat the animals inside would live in which is great for children to learn about. 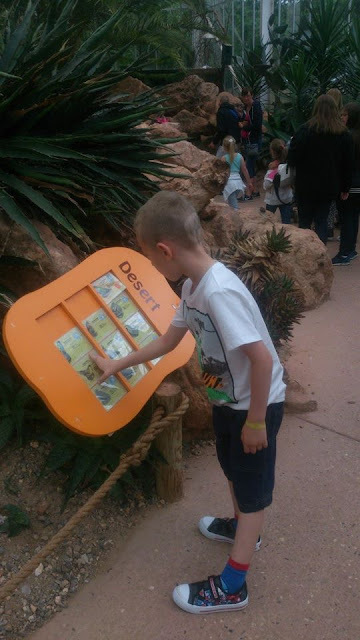 We loved how interactive Paignton zoo is and just how much you can learn from the large fact boards that are dotted inside and outside of each habitat giving fun and education information about different animals and habitats. A big favourite of both James and Evelyn's was the lemur section where you can walk across the bridge and actually enter the section where the Lemurs roam freely. You can get really up close to them (as you can see from the picture above with Evelyn). 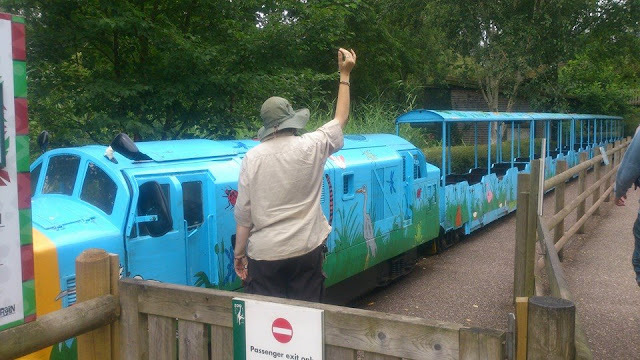 As well as exploring the animals and zoo on foot you can also catch a ride on the zoo train which takes you on a loop around a small part of the zoo where you can see lots of the birds on the lake as well as catch a glimpse of the lions and a few other animals that may be around! These prices do include a 10% donation towards vital conservation work but you can choose to opt out of this making the tickets cheaper. 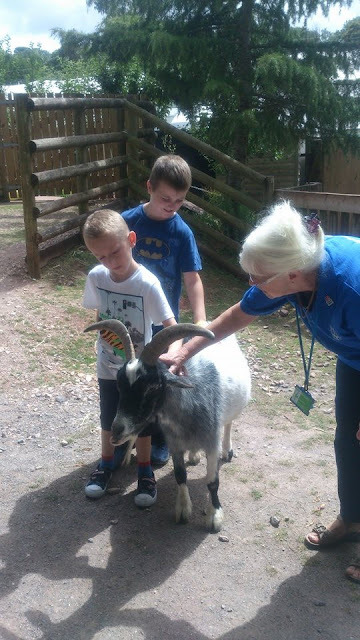 We had a fantastic day out that we all loved, there was so much to do at Paignton zoo we were certainly kept entertained for the full day making the prices feel great value for money! There were so many animals and despite the zoo being busy (as expected during summer holidays) we were able to see all the animals, take photos and didn't once feel rushed around or squashed in. The play parks and picnic area's are clean and well kept giving great areas to take a break from walking around and have some lunch. One thing that really stood out for us was the passion and love for the job by the people working at the zoo. One lady in particular who was working in with the goats really stood out for us. James was a little wary about going in with the goats and touching them, she was so kind and she took James with her and explained about the goats and told him their names. She took his hand and managed to get him walking with the goats and stroking them, he hasn't stopped talking about Eric the goat since! If you haven't been I can highly recommend a visit you won't be disappointed. There is lots of walking so make sure you wear comfortable shoes! Have you ever been to Paignton Zoo? If you want to find out more about Paignton Zoo you can visit their website here - www.paigntonzoo.org.uk. Aww Paignton Zoo looks fantastic! Looks like you can get up very close to the animals. My closest zoo is Edinburgh zoo which is amazing. Looks like a good zoo to visit on holiday. It's been a while since I've been to one. Zoo visits are such fun, we have been to a few as a family. Never been to Paignton Zoo, but we love trying new zoos when we go on holiday. 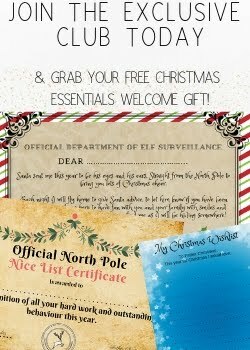 Not near us but we do have another zoo which you've reminded me to go back to! Love the cute zoo train and the lemurs, my son would really enjoy it. What a lovely place to visit - love the train, and also that the staff were so lovely and helpful. Looks like you had a really wonderful day out. Can't beat a trip to the zoo, really!